Anthony Camnetar remembers the first time he was told that he had von Hippel-Lindau syndrome, a rare genetic disorder. He was 12 years old and his mother, who had just picked him up from school, broke the news through tears realizing the health challenges her son would face for the rest of his life. While he didn't fully understand it at the time, Anthony – now 23, married, and a father – would later grasp the significance of that day years later when it came time to remove the dozen tumors that had sprung up throughout his body. He would start down a path that would result in multiple surgeries at different hospitals and long and frustrating periods of recovery. 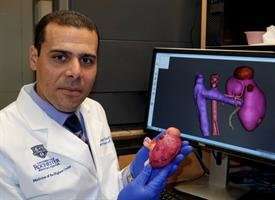 His journey would ultimately lead him to University of Rochester Medical Center (URMC) urologist Ahmed Ghazi, M.D., who would build an exact replica of Anthony's kidney – complete with tumors – allowing him to practice the complex surgery Anthony required long before he went under the knife. The gene responsible for suppressing tumors is flawed in von Hippel-Lindau syndrome, resulting in uncontrolled cell grow and division. This, in turn, can give rise to tumors in multiple organs which typically begin to appear in early adulthood. A few years ago, Anthony underwent surgery to remove a tumor from his brain. Physicians also spotted multiple tumors in both of his kidneys and his pancreas. Operating on Anthony's kidneys posed a significant challenge. During this procedure, called a partial nephrectomy, the surgeons attempt to remove the tumors while preserve as much of the healthy kidney tissue as possible in order to avoid the need for dialysis or a kidney transplant. The kidneys are highly prone to bleeding – despite their small size, they received 20 percent of the heart's blood output – so surgeons will typically clamp the vessel that supplies blood to the organ before resecting the tumors. However, this makes the procedure a race against the clock as blood flow must be restored within 30 minutes or the kidneys become irreversibly damaged. Anthony, who lives in Dansville, New York, decided to have the surgery on his right kidney done at a major cancer center in New York City. While partial nephrectomies are typically performed using robot-assisted surgery, a technique that is preferred because it is minimally invasive and results in a shorter recovery period, the surgeons there decided to remove the tumors via open surgery. This approach allowed the surgeons to pack the kidney in ice; essentially putting the organ into hibernation and giving them more time perform the procedure once the blood supply was cut off. However, this open surgical method has significant drawbacks. To get to Anthony's kidney, the surgeons had to make a 10 centimeter incision in his side, cut through muscle, and remove one of his ribs. While the surgery successfully removed the tumors, it led to a long recovery period and Anthony struggled with pain for several months. "It was tough figuring out how to provide for my family because I wasn't able to work and still I am only allowed to lift 25 pounds," said Anthony. When it came time perform surgery on his left kidney, which had five tumors, Anthony reached out to Ghazi, an assistant professor in URMC's Department of Urology and the Wilmot Cancer Institute. Because of the complications from his first surgery, he wanted to explore the possibility of having the next procedure done robotically and had heard about Ghazi's unique approach. "Robotic surgery is the preferred method for performing a partial nephrectomy," said Ghazi. "It leads to less pain and faster post-operative recovery. Now that is the gold standard for one, maybe two tumors in the kidneys, but for five it is nearly impossible." Like many experienced surgeons, Ghazi is passionate about honing his skills and perfecting his craft. While there are many different systems that allow surgeons to simulate robotic surgery, Ghazi found that none of them were capable of fully recreating the experience, including the environment in the operating room, the pressure of racing against the clock, and the feel and responsiveness of real organs. Unsatisfied with existing surgical simulation models, Ghazi partnered with Jonathon Stone, M.D., then a resident in the URMC Department of Neurosurgery who also holds a degree in biomedical engineering, to establish the Simulation Innovation Laboratory to develop a system of fabricating lifelike artificial organs, which would allow surgeons to practice complex cases in advance of the actual surgery. 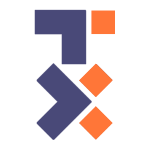 The process begins by converting images obtained from MRI, CT, or ultrasound scans from the patient into computer-assisted designs (CAD). The CADs of organs are converted into molds, or negatives, which are built using a 3-D printer. In a process akin to casting a bronze statue, the molds are then injected with a hydrogel which, after freezing, assumes a solid state. By altering the concentration of the hydrogel, the team can add denser tumor mass and other components of the organ, such as blood vessels. The team also assembles entire segments of the body, complete with artificial muscle tissue, skin and fat, and, depending upon the area of interest, the liver, intestines, spleen, kidney, and other adjacent organs and structures. Artificial blood vessels are connected to bags of red dye that will "bleed" if cut. This process allows them to replicate the entire surgical process of guiding instruments to the right location, moving other organs out of the way, clamping blood vessels, and resecting and removing tumors. "These rehearsals allow you to save operating time, decrease blood loss, potentially avoid complications, and prevent time you have to trouble shoot," said Ghazi. "All of this directly impact patient outcomes." The URMC simulation model is gaining national recognition. Presentations of the simulation program have won numerous awards at national conferences and earlier this year, Ghazi and his colleagues conducted a live surgery in Rochester that was broadcast to attendees of the North American Robotic Surgery Symposium in Las Vegas. The surgeon who performed a partial nephrectomy had practiced on a model created by Ghazi because the vessels that supplied blood to the kidney potentially interfered with the removal of the tumor. Months ahead of the planned surgery, Ghazi created an exact replica of Anthony's kidney. In fact, he created five replicas and conducted full rehearsals in the operating room using the robots, including a final practice run the day before the actual surgery. "I started rehearsing using different game plans and deciding which tumors I was going to remove first," said Ghazi. "And you can only figure that out by trying it a couple of times. It turns out that two of the five tumors could be removed before I cut off the blood supply and the rest needed to be done after the blood vessel was clamped." When the day came for Anthony's surgery, Ghazi was confident he had developed the right approach. He successfully removed all five tumors, preserved 90 percent of the kidney's function, and was able to restore blood flow in under 24 minutes. "Recovery was so easy," said Anthony. "A week after surgery I was able to walk around. The last surgery I had it took about a month and a half for me to be able to walk around without pain. I was able to hold my son two and a half weeks this time as opposed to two and a half months." "Patients come to us with the most complex cases and the challenge is to make these cases simple," said Jean Joseph, M.D., M.B.A., chair of the URMC Department of Urology. "We can create it so we don't have to wait until the next time so we can be better at it. We can be better at it the first time because we can practice it and more quickly get people back to their normal lives."